Rethink your business model to incorporate the power of “user” experiences. Brian Solis is a principal analyst at Altimeter Group, and is globally recognized as one of the most prominent thought leaders and published authors in new media. A digital analyst, sociologist, and futurist, Brian has studied and influenced the effects of emerging media on business, marketing, publishing, and culture. His book Engage! is regarded as the industry reference guide to building and measuring success in the social web. His most recent book, The End Of Business As Usual, looked at the changing consumer landscape, it’s impact on business & what companies can do to adapt & lead. Explains why experience is everything and how the future of business will come down to shared experiences. Aligns the tenets of user experience with the concepts of innovative leadership to improve business performance and engagement and to motivate readers to rethink business models and customer and employee relationships. Motivates readers to rethink business models, products and services, marketing, and customer and employee relationships with desired experiences in mind. 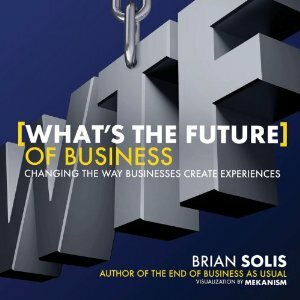 To mark the publication of Brian’s new book, Social: IRL is giving away a free copy of What’s The Future of Business, each Friday from now until March 8. Learn more and enter to win at Facebook.com/socialirl.